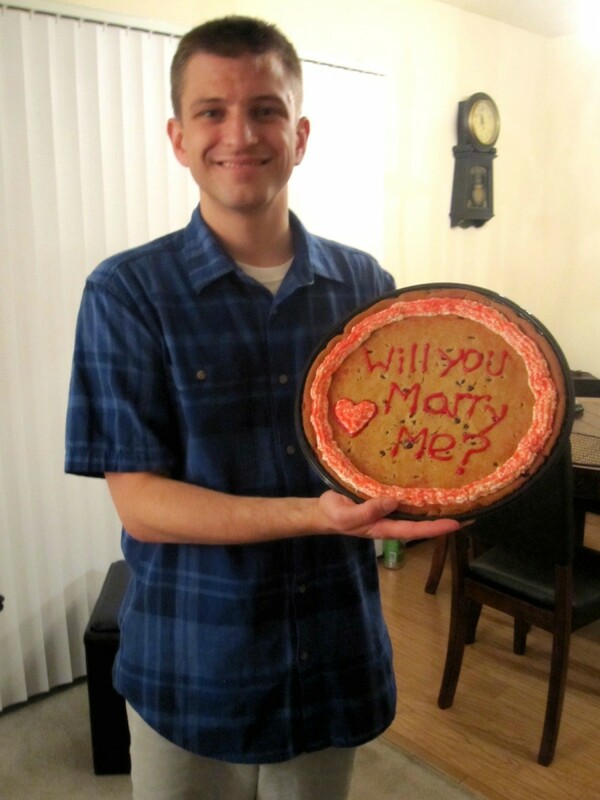 Yay, you’re engaged! You get to spend the rest of your life with the love of your life. And you get to celebrate with a huge party! But oh crap, how the heck are you going to pay for it? This was the situation Josh and I were in when we got engaged in 2012. I was entering my senior year in college and Josh was entering his last year of graduate school. We were crazy in love and also flat broke. The thought of paying for a wedding was overwhelming and the idea of going into debt for a party was absolutely out of the question. We knew we wanted a perfect day but we weren’t sure how we were going to afford it. Thanks to Internet searches, the magic that is Pinterest, a lot of DIY, hands on work, hustle, and creativity we were able to get married and party with our 100 closest family and friends for only $8,500. It was a beautiful wedding, and even better, a day that truly reflected us. 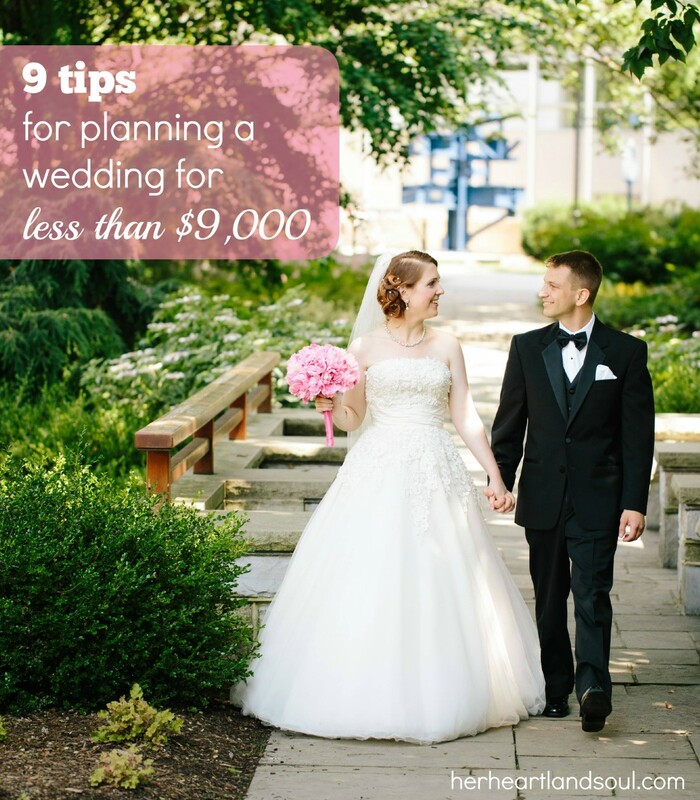 In honor of our upcoming two year wedding anniversary, I thought it would be fun to share 9 tips for how to plan a wedding for less than $9,000. You do not have to go into debt for a beautiful day. 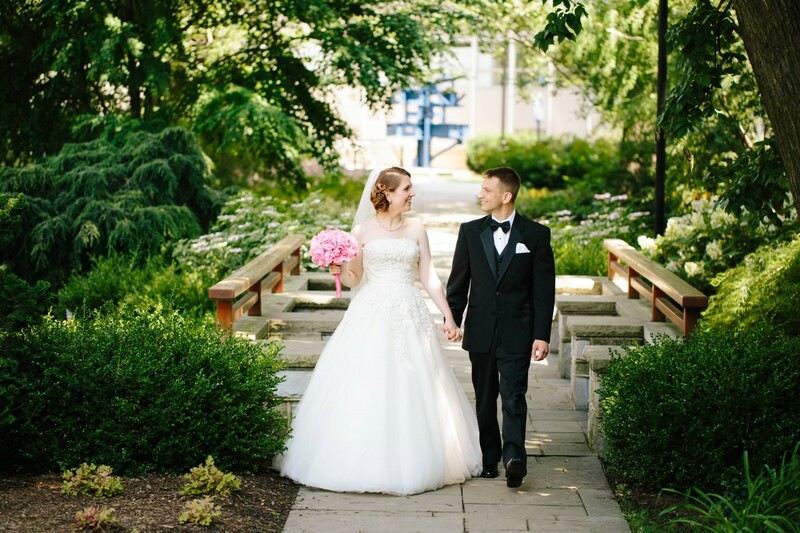 For more details of our wedding planning process and wedding recaps check out my wedding page! Quick caveat: Every money-saving list I came across while planning my wedding told me to skip a wedding cake and nix hiring a professional DJ. This was no bueno in my book. 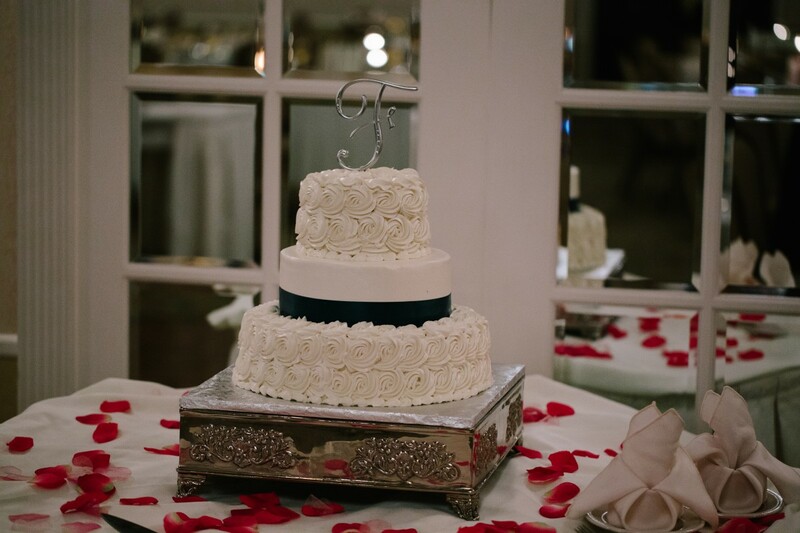 We had an absolutely delicious wedding cake. That I made sure to take time to eat, at my wedding. And an amazing DJ who knew how to get the party started. 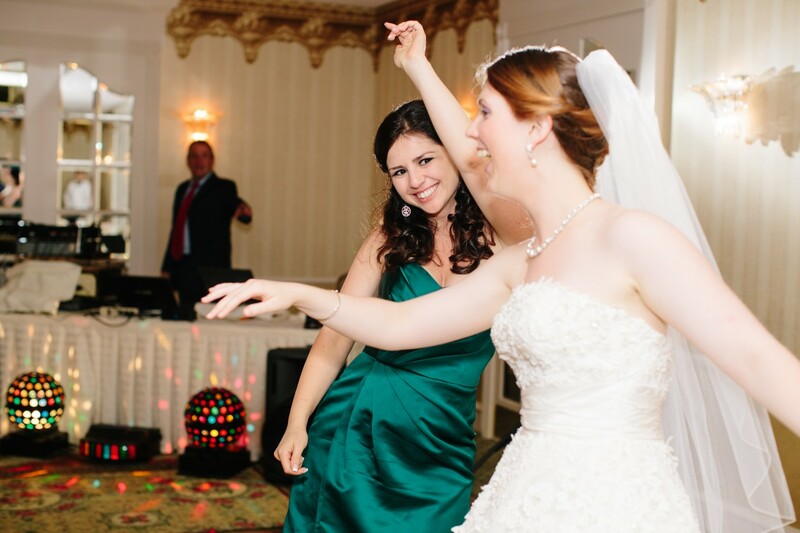 It was important to me that we celebrate our big day with dancing. The big thing to know is that with a limited budget comes limited priorities. You can do some things but you can’t do all the things. Sit down with your fiancé and make a must-have list. Once you know what you absolutely need to have at your wedding you can start to figure out the things you can do without. I feel like everyone recommends having a Friday or Sunday wedding to save money. That didn’t work for us, as 80% of our guests were traveling between two to eight hours to get to the wedding. It needed to be on a Saturday so they had a day to either get there early or stay late. What did work was having a Saturday morning wedding. The price of a morning wedding was half what it would be in the afternoon/evening, serving lunch was significantly cheaper than serving dinner, and we could get away with offering wine spritzers and beer during the cocktail hour and then calling it good in the alcohol department. This one decision saved us SO much money. This is where I’m going to sound ridiculous, but I was not willing to wear a cheap wedding dress that I was unhappy with for the sake of saving money. 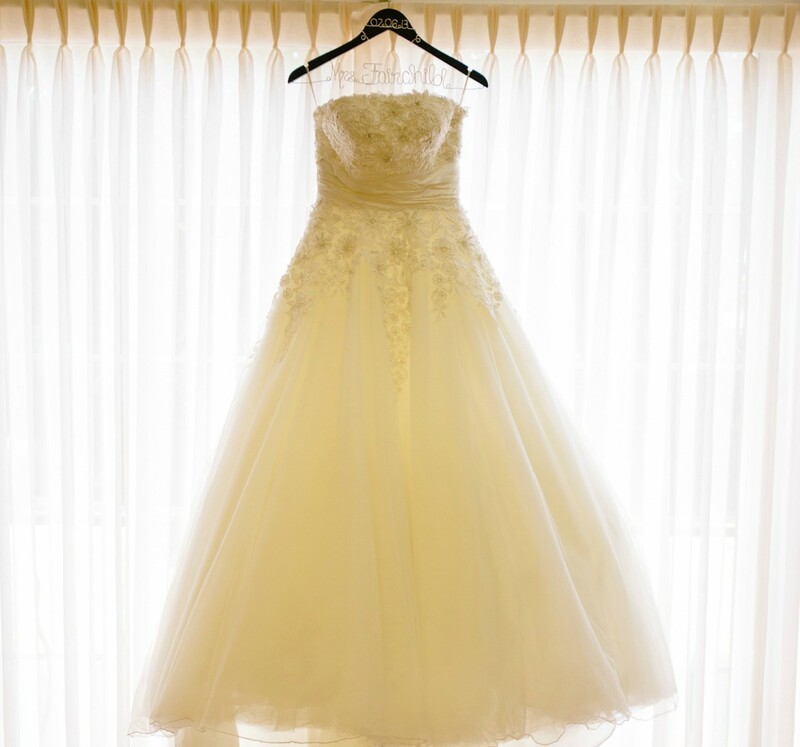 I wanted to look and feel beautiful on my big day, and I wanted to wear something that made me feel like a princess. My kids will only have pictures of our wedding to look at and I wanted to look good in those pictures! Thanks to Once Wed I found my dream wedding dress used for $500 and saved roughly $1,500. The girl I bought it from and I were both 5’7 and off-the-rack size 6s. It hadn’t been taken in at all, was hemmed and bustled to my height, and professionally cleaned. She had even paid extra to have the zipper replaced with a lace-up corset. It was like I was meant to wear this dress. I felt like a million bucks in it without spending anywhere close to that. 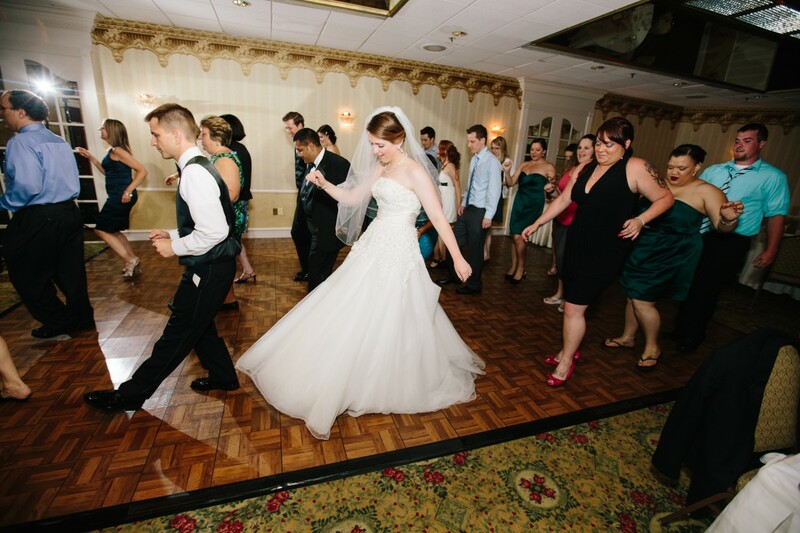 I’m a big proponent of used wedding dresses because I wore my dress for one day. And two years later it’s still sitting in my closet in the same box I brought it to Omaha in. This one was a hard one for me. I LOVE real flowers. If money wasn’t an object, I would have been holding the biggest peony bouquet you could image as I walked down the aisle. I’d have been married in front of an archway of blooms and our centerpieces would be overflowing with flowers. But money was an object, and at the end of the day flowers were not a priority. We bought all of our fake flowers from Michaels with 50% off coupons and ended up spending less than $200 when all was said and done. I posted a tutorial way back when on how to make your own DIY wedding bouquets that explains our entire process. Looking back two years later I have no regrets. The fake bouquets served their purpose and looked pretty without breaking the bank. If you’ve got a talent, see if you can trade for someone else’s. 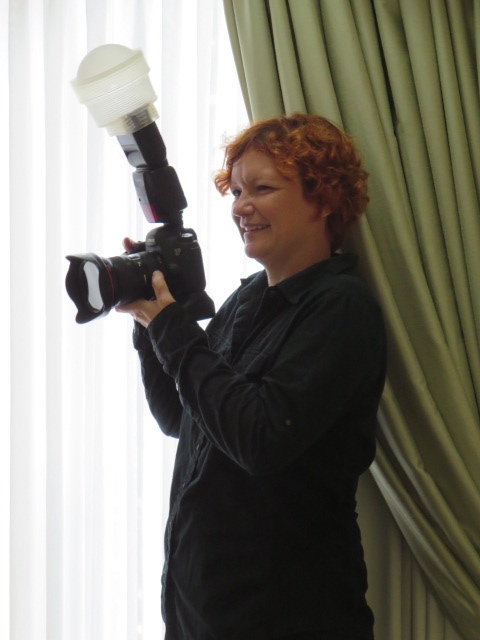 That’s what I did with my amazing wedding photographer, Redheaded Ninja. 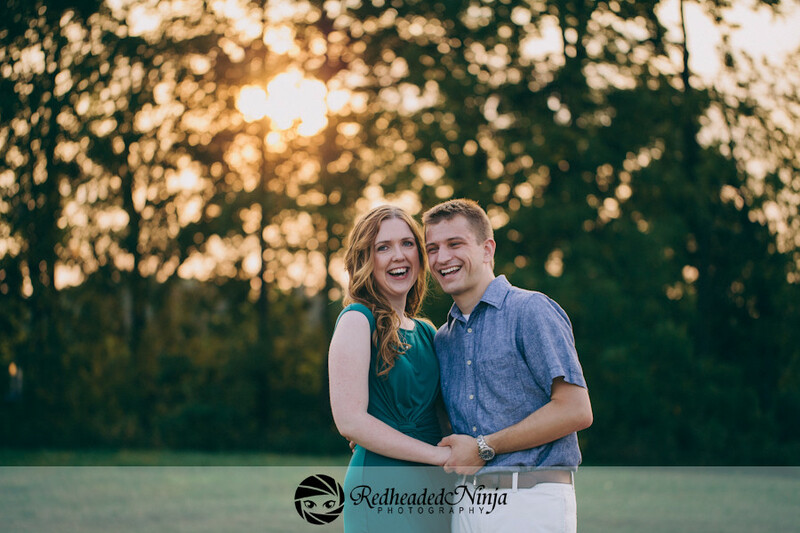 I blogged for her for a year in exchange for my engagement and wedding photos. In terms of priorities, I was totally fine skipping an open bar to save money. I was absolutely not okay with skipping wedding photos. These photos are truly priceless to me. In terms of financial savings, bartering my services saved us $3,500 in photography expenses. You use these for literally four hours. That’s it. I rented the votives for all our tables for $100 from a girl I knew that just got married. We sprinkled some fake rose petals, I glittered up a few signs, and we called it good. Bonus: We didn’t have to worry about what to do with them when the wedding was over! (We moved to Omaha literally two weeks after our wedding!) While I know there’s nothing like walking into a wedding with crazy uplighting and gorgeous towering centerpieces, we couldn’t afford it, and it wasn’t a priority. 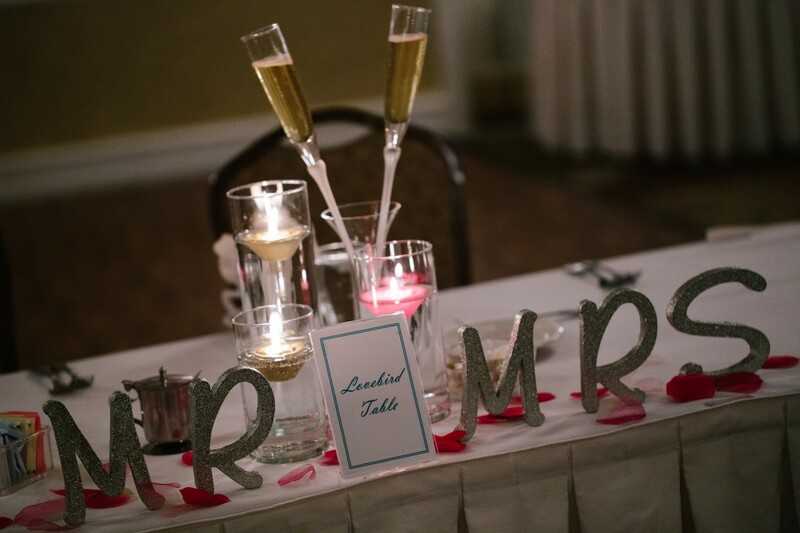 I think our centerpieces were cute and added a nice touch to the room. Before getting married I had no idea how expensive marriage officiants were. In case you’re wondering, they’re super expensive. And Pennsylvania has pretty strict laws regarding marriage officiants which meant we couldn’t just have a friend get ordained and marry us. Through research we found out that mayors are allowed to perform marriage ceremonies. And most of them do not charge anything for their services. 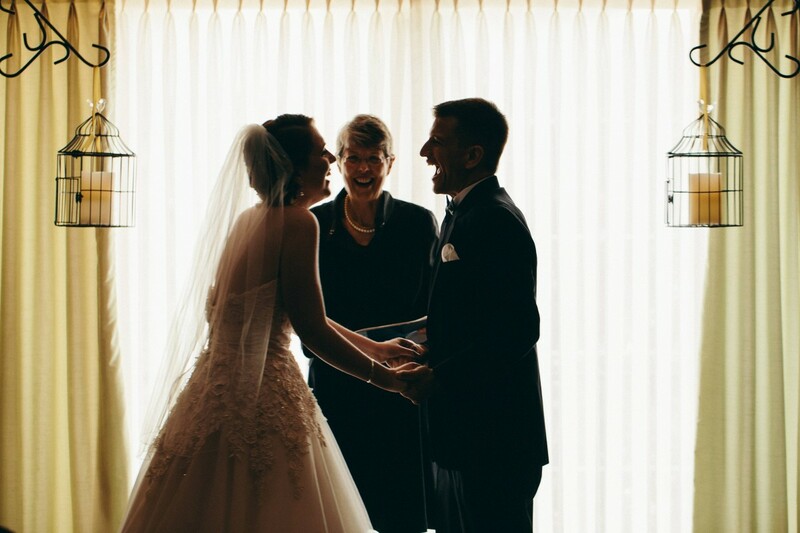 This worked out perfectly because Josh was raised Jewish and I was raised Christian, so we were able to take religious institutions out of the equation and have the Mayor of State College marry us. She’s the sweetest woman and did an incredible job. It made it extra special that we were married by the Mayor of the town where we met and fell in love. An added bonus of not having a standard wedding script to follow is that it allowed us to write our entire marriage ceremony together. I love how it perfectly reflected us. 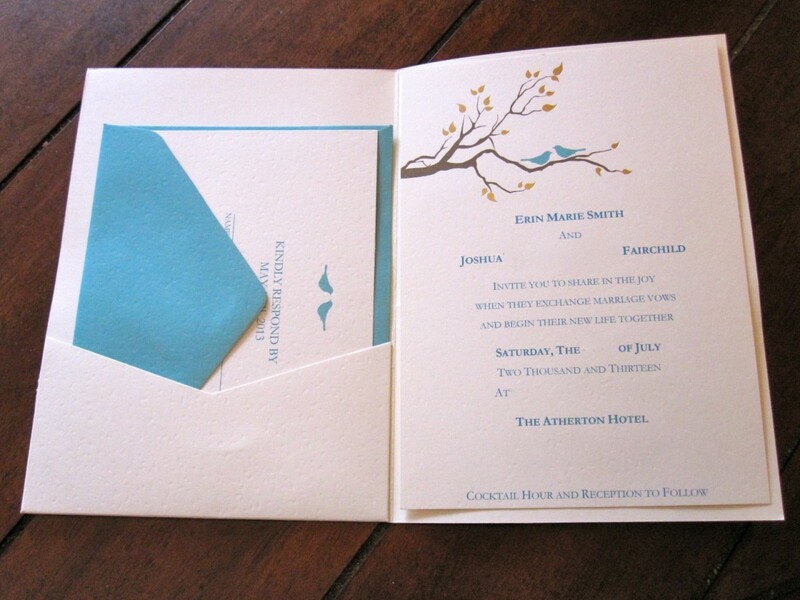 There is some REAL cost savings to be had by making your own wedding paper products. Our save the dates cost us $20, our wedding invitations cost us $75 (and are the inspiration that led to our entire bird theme at our wedding), and our paper goods at the ceremony and reception cost us pennies. You can absolutely have high quality paper goods at a fraction of the professional price. This worked out great for us since at the end of the day all of it gets thrown out. If you are blessed with family and friends who want to help you on your special day, take that help. Josh had been going to the same hairstylist since he was a little boy. 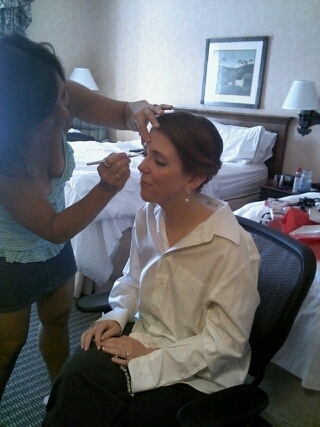 That hairstylist has become a close family friend and not only came to the wedding, but offered to do my hair and makeup. She made me look beautiful on my big day and I am forever grateful. One of Josh’s close family friends is an amazingly talented singer. She teaches vocal classes at a super prestigious private school in New England. And she offered to sing during our wedding ceremony (before I walked down the aisle) and the last song at our wedding reception. This was such a special gift and it took our wedding to a completely different level. These gifts definitely save money, but they are also priceless memories in their own right. Sometimes it’s not fun to be on a budget. You may really want those chiavari chairs and an expensive videographer like I did and not be able to work them into your budget. You may go to weddings six times the cost of yours and know yours will not look the same. But guess what? It’s one day! It’s one perfect, magical, beautiful day, but if you’re marrying the right person it’s just the continuation of many incredible days. Two years later, I’m glad we spent the amount we did on the wedding. It was enough to give us an amazing wedding that I feel proud of, but also affordable enough that we were able to save money for starting our new life together. No matter your wedding budget or your priorities for the day, if you found the right person to spend the rest of your life with, you’re winning at life in my book. And that is worth way more to me than any party. Questions of the Day: For those that are married, how did you save money on your big day? For those that are not married, what are your priorities for your wedding? These are great tips, lady. Weddings can get SO expensive. 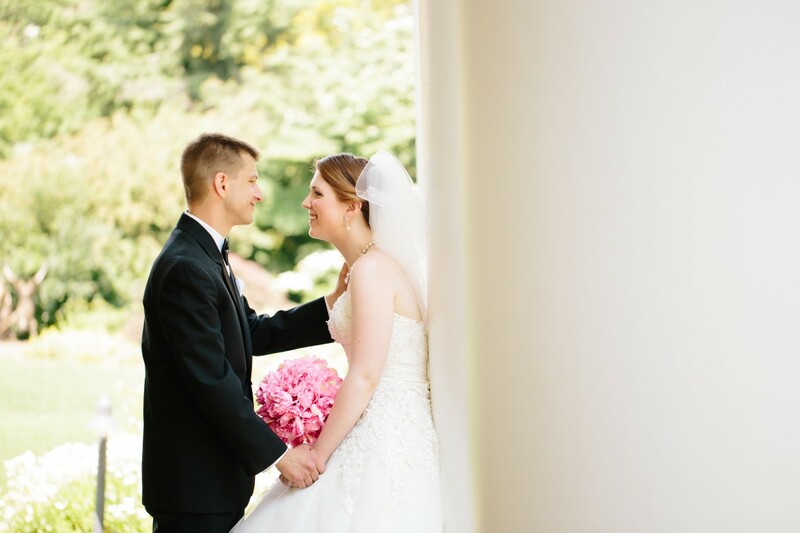 Love the shots from your big day- gorgeous! Thank you so much Ashley! It was such a special day! Such great tips! Thanks so much for sharing and beautiful pictures too! Absolutely! And thanks so much Samantha! I’m in love with the photos! It truly is such a special time!! I totally get the feeling of being ready for the wedding but looking back I’m so glad I was able to enjoy the engagement like I did. There’s truly not another time like it! Yes!! Your wedding was BEAUTIFUL! 🙂 Jon and I had a great wedding for just under $7k. Living in Omaha at the time helped with that! 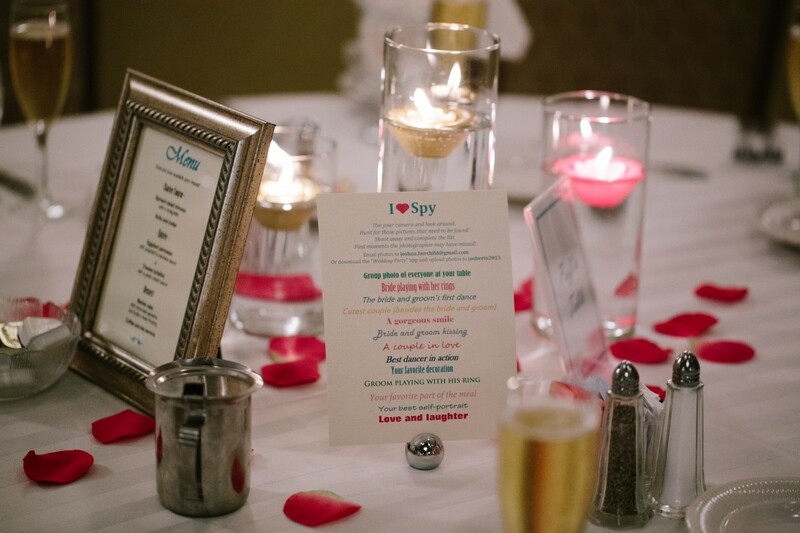 We actually got married at Lo Sole Mio, an Italian restaurant you should definitely check out if you haven’t yet! It’s kind of a hidden gem. Great tips! I think it’s all about balance…you have to decide what you are willing to sacrifice and what you really cannot live without. For me, outside of my dinner and invitations, everything else was DIY or was a service provided by a close friend! Thank you so much Kelly! My dress was my dream. I can’t believe everything worked out the way it did with it! And yes, it’s completely a balancing act. Definitely saving this post for the future! Such good tips and advice! Aw thanks Brie! It was fun getting to write this all up. It gave me major wedding flashbacks! First of all, all your photos are so beyond gorgeous!! These are great tips. I hate that weddings are so stinkin’ expensive. There are so many little things you never even think about! 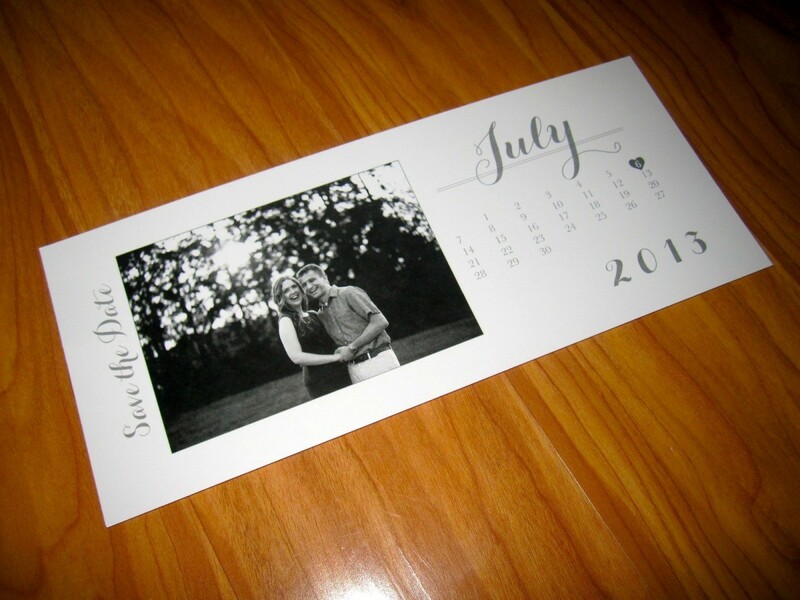 I’ve seen several people e-mail their wedding save the dates and invitations which I think is a great cost saving option too. Aww thank you Stacie! I know, the cost is kind of mind-blowing! Such a beautiful wedding! That’s so cool that Elizabeth got to marry you..I was a huge fan of her when I went to Penn State and got to meet her a few times since I was in the student government! I’m not really a wedding person, so my fiance and I are going to Belize for a week and having a small ceremony down there. It’s only $1,000 and it’ll be at a waterfall! That’s much more our style and I couldn’t be more excited about it! That sounds like an absolutely amazing wedding!! I’d love to go to Belize one day! And yes, Elizabeth was such a sweetheart! P.S. I love seeing your wedding photos again! FINGERS CROSSED YOU’LL BE USING THESE SUPER SOON!!! Food and drink will definitely be my number one priority at my wedding. After that it would definitely be my dress and the photographer. I feel like everything else could be scaled back and I would still feel absolutely beautiful : ) Great post – I really love all your unique tips ! Aw thank you Jamie! I’m glad you enjoyed the post! I had a lot of fun putting it together! It gave me major wedding flashbacks! I swear the best wedding I have ever been to was held in a dingy basement in South Dakota. They had string lights hung around, fake flowers, a cash bar, some sandwhiches and pasta salad and the bride wore a $200 dress. But they did hire a DJ for 2 hours and that was all anyone needed. It was a total blast! But it was really the couple that made it so special, they couldn’t keep their eyes off of each other the whole night, it was so adorable. I had never felt happier for anyone then I did for them that night. That sounds like an absolutely amazing wedding! That can really make a difference too! This is such a fabulous post. I know so many people engaged and am attending a bunch of weddings. I am not ready for marriage yet but am scared of how much it costs. I like coming up with things that you won’t budge on and compromising other things. I’m all for a sweet cake, DJ, and at least having my bouquet real! Those all sound like awesome must-haves! These are such good ideas!! I love the idea of having a morning wedding! Thanks Melanie! It was a great solution for us and cut our venue budget in half! These are some truly awesome tips. It’s wedding season, and as I’ve been hearing what people spend on them…my brain wants to explode and then elope. Haha. But your wedding pictures are so beautiful! I am super impressed by your spending. Thanks for sharing your tips! Aw thank you Amanda! Yeah some of the numbers just made me want to cry thinking of saving up that kind of money for one day! But for the people who can afford it and do power to them! We more or less eloped/destination wedding’d by going for a gorgeous d all wedding in Virginia 8 hours away. We invited one friend and our parents/my brother abd dates for everyone, and that was it. My dad paid for my dress,and the owner of the inn we were staying at/married took care of everything in the package : officiant, cake, food, cocktail hour, music. She even took beautiful photos using my camera. It was such a great day and we only spent 2500. The honeymoon was more important to us!! Yeah we lucked out that State College was not a super expensive place to get married. If we looked at my hometown, the Poconos, there’s no way we would have been able to keep the cost this low. Great tips! 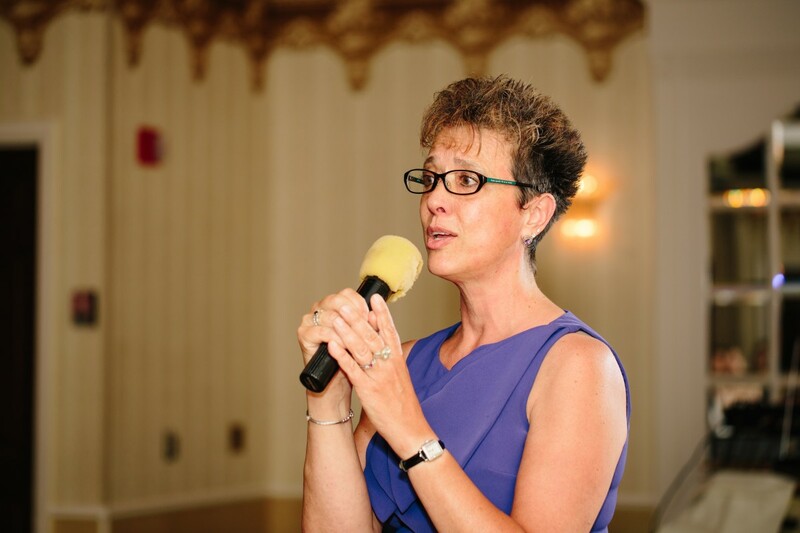 I was VERY fortunate to have my parents foot the bill for my wedding, it was amazing, but if I would have had to do it myself it would have been a MUCH smaller affair! That is such a gift! I’m sure you were a stunning bride! Yes! A DJ pumps up the crowd, knows how to take in the mood of the crowd, and can keep the party going! I’m so glad I invested in one! Happy 14 years of marriage!! You know a lot of talented people! <3 How wonderful you were able to design your wedding dress!! Thank you so much for posting this! I actually have one of your old posts bookmarked for the wedding invitation/save the date templates which I think we are going to pretty much do the same that you did. We aren’t going to have anything extravagant & are looking for any ways to save money. I’m definitely going to be making my own centerpieces (probably with fake flowers too…) and am contemplating ordering a super cheap, yet beautiful dress I found on the Macy’s website. Saving this post too! 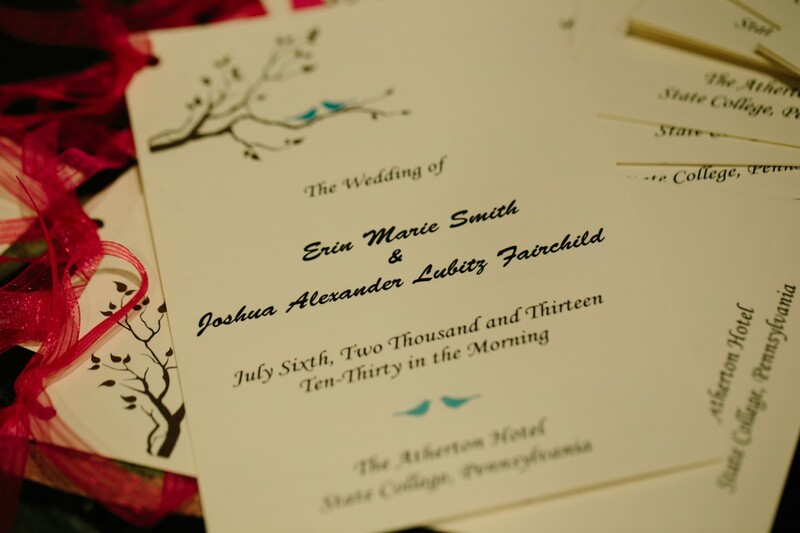 I loved those wedding save the dates so much! I originally found them on PBFingers blog! Seriously the best tips!!!! I swear when I get married, I will send E-Vites and I will get it Whole Foods catered, LMFAO! How fun! I wish I had pretty enough handwriting to do calligraphy! Yes to time with family before the wedding! We actually invited everyone to our rehearsal dinner because almost everyone was coming in from out of town! Wow you guys did awesome for having that many people and only spending that amount of money! Way to go! Great great great tips!!! Weddings can be unreasonably expensive but what truly matters is having fun and enjoying the moment 🙂 I’m happy to see you did just that! Thank you so much Mel! We really did have fun and enjoy the moment! I sure wish I had read this before I got married! Great tips! Your wedding looked really beautiful! Great tips, everything turned out beautiful! Great tips! Your wedding looks beautiful and you look gorgeous as well! You look fabulous and your wedding wonderful – some very happy memories in those photographs and it goes to show you can have a gorgeous wedding without breaking the bank. More seriously, in a previous life I was married and now… I travel solo ah ah. You didn’t mention food/beverages at all. I found that to be a big obstacle. I’m already married and have no intention of coordinating a wedding ever again, but I bet load of people would love to hear your tips on the food/beverage side of things. You’re approach with the rest of the wedding was pretty straight forward, so I bet people are itching for food tips. My #1 to put on there: cater through your favorite non-trendy food truck. They will provide amazing food, bend over backwards for you, and will be grateful for the business. Those are great tips! It’s outrageous how expensive weddings are these days.